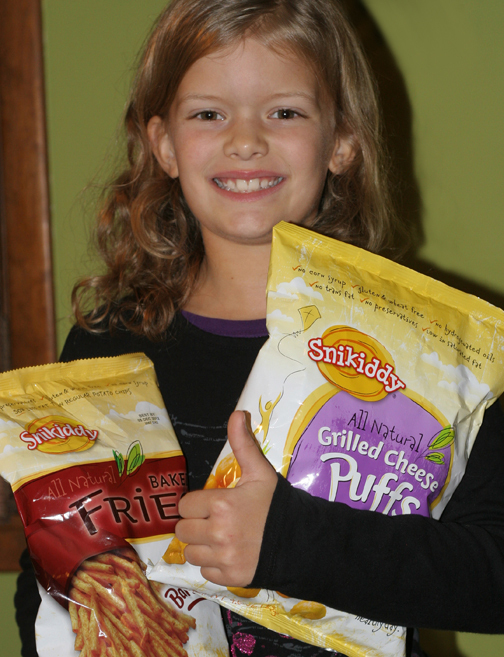 This post is long overdue… Snikiddy has been a favorite brand name in our house for the past few years when we first picked up a bag. What kid doesn’t love super-crunchy snacks they can both eat and play with? We’ve tried a few Snikiddy varieties, but my daughters’ favorite is their grilled cheese puffs, which are little, cheddar-cheese flavored, crunchy balls of gluten-free goodness. They never get sick of them, and if we are buying a bag of Snikiddy, that is the kind they always choose. Here are the ingredients for the cheese puffs: CORNMEAL, RICE FLOUR, SUNFLOWER AND/OR SAFFLOWER OIL, CHEDDAR CHEESE (CULTURED PASTEURIZED MILK, SALT, ENZYMES), NONFAT MILK, WHEY, SALT, NATURAL FLAVOR. You won’t see chemicals or artificial colors in these babies. Snikiddy products contain no corn syrup, no hydrogenated oils, no trans fat, no preservatives, are low in saturated fat and are wheat and gluten free. It’s a healthier alternative to so many other similar snacks. 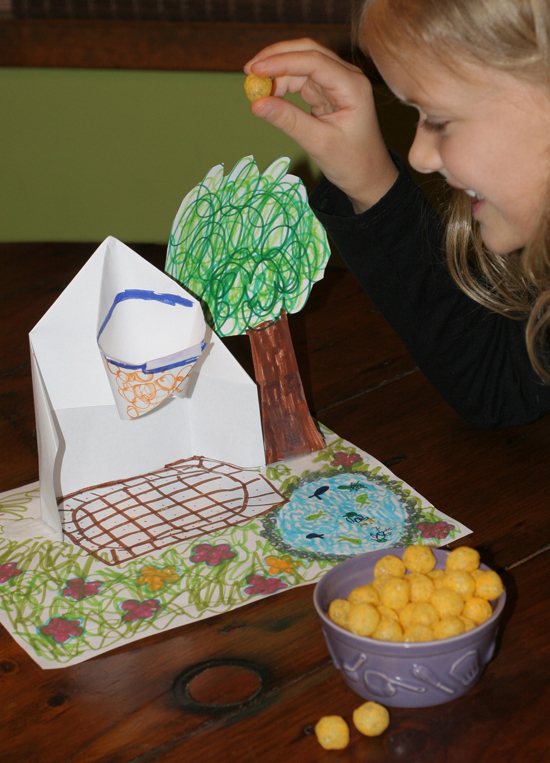 Just for fun: My one daughter enjoyed making this origami basketball hoop (below) to toss her cheese balls into. Even if you don’t like your kids to play with their food, this is still something they could easily learn to make. Of course my daughter had to make a whole park to go along with hers! 🙂 Instructions for a simple hoop are on this video. For more information about Snikiddy, please take a moment to visit their website: You can find out more about the company & its people at: http://snikiddy.com/about and you can read more about their products here: http://snikiddy.com/products. So — I’ve got a simple giveaway for you… Snikiddy was kind enough to send me some free product coupons which is what I’ll be giving away. There will be 3 random winners, each receiving a “free full size product” coupon and a $1 off coupon, which they can redeem themselves at a local retailer. To enter, all you have to do is leave a comment below, letting me know which Snikiddy snack your child would most like to try if you were to win these coupons. Disclaimer: Snikiddy sent me free product coupons for this giveaway. I only promised an honest review and was not compensated in any other way. Opinions are my daughters’ and my own. This entry was posted in Activities for g-free kids, fun for kids, giveaways, reviews and tagged expiriment, fun ideas, giveaway, gluten free diet, gluten free kids, review, snacks by kachalmers2. Bookmark the permalink. We would love some Grilled Cheese Puffs. Yum! Since you and your daughter praised so highly the grilled cheese variety – that would be my choice. Thank you for the giveaway. Definitely Baked Fries! Thank you! The sea salt fries look great! Im going to look for their products in our local stores. Thanks for sharing! My children would like the cheese ball ones. The cheese puffs. We have never tried anything like this but children are very adventurous aren’t they? So I know they would love to try them. Thank you for the giveaway. Always think about trying them but never have. We would probably try your recommended faves! We have eaten the fries, they used to sell them at our Costco. I’d have to say the grilled cheese puffs. Thanks for the giveaway. I have never heard of this brand. My daughter really misses french fries, so I think we’d try the baked fries. My son loves the mac and cheese puffs but now I can’t wait to try the grilled cheese kind! We are new to the GF life… 3 year old diagnosed with Celiac in October. I had never even heard of this brand until your post. I am always looking for fun snacks to send with her to school and any of these snacks look like they would fit the bill :-). Since she was always so fond of grilled cheese (pre celiac), I imagine those would be my pick.